Less than a month after the Army announced it is reducing its forces by more than 8 percent, the 14th annual N.C. Defense and Economic Development Trade Show appeared as packed as ever Monday with attendees and several vendors saying they would weather any downsizing. Fort Bragg is losing only 842 positions out of 53,700 uniformed personnel, suggesting that local contractors will be little affected. But contractors operating this area sometimes take jobs at installations elsewhere, where the force restructuring could be more severe. 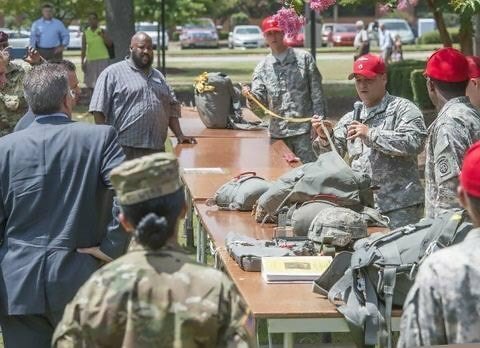 The trade show is presented by the N.C. Military Business Center at Fayetteville Technical Community College to bring together the military, military contractors and others in the defense-services sector. More than 100 vendors displayed a variety equipment, such as the expected firearms and tactical gear, mundane but important items such as metal tie-down loops capable of holding 50,000 pounds of equipment in place on the back of a truck bed, and experimental gear in the form of airborne electric generators designed to supply power to troops on the ground. Organizers estimated that 750 to 800 people attended. A breakout session with Fort Bragg’s Mission and Installation Contracting Command drew several hundred contractors seeking to learn about available projects and how to bid for them. About $1.2 billion in projects moves through the command annually, said Col. Carol Tschida, commander of the 419th Contracting Support Brigade. This past year’s spending was up $40 million as opposed to the prior year, she said. She couldn’t estimate future spending. Some jobs are small, such as an $11,000 contract to board and care for “Pfc. Jack Huck Blackjack,” a mule that serves as the 1st Theater Sustainment Command’s mascot. Others include a $15 million dining services contract at Fort Campbell, Kentucky, and a $249 million construction contract there. Back in the exhibition hall areas, companies such as INI Power Systems of Morrisville and Panakeia LLC of Virginia tried to catch the eyes of soldiers and other attendees. INI sells small electric generators that can run off any liquid fuel or pressurized fuel, said Matt Mendez, the company vice president. For example, Mendez had a liquor bottle sitting next to a 2-kilowatt generator the size of small suitcase. The generator, designed to replace larger, more cumbersome generators that the military uses, can run on alcohol if that’s all that’s available, Mendez said. Account manager Karen Triggs of Panakeia had a table with tiny sponges on display, each about the size of a fingertip. The sponges, dozens at once, are designed to be injected into gunshot or shrapnel wounds to stop a victim’s bleeding, Triggs said. The hemostatic sponges expand to 20 times their original size when they come in contact with blood. Mendez and Triggs said they don’t think their companies would be harmed by the Army’s force reduction. INI’s generators will be in demand, Mendez expects. And Triggs said her sponges should be, too. The sponges came on the market in 2014 and should be an important tool in emergency medical care on the battlefield and for civilian emergency responders, she said. Emmett Fahringer of Stillwood Ammunition Systems in Sanford said he caters to a small specialized market and doesn’t anticipate the Army’s reduction to affect him. Stillwood develops and makes specialized bullets to higher-quality standards than most on the market, Fahringer said. Michael Vaden, founder of the Gryphon Group tactical training training firm in Scotland County, said his company has grown while his competitors closed because of the cuts of the federal budget sequestration and the end of the wars in Afghanistan and Iraq. Vaden thinks Gryphon survived because the company concentrates on a core mission of teaching battlefield and tactical leaders how to make the right decisions in combat situations. “Our end state cannot be profit,” Vaden said. “Our end -state has to be men and women coming home to their families after going into harm’s way,” Vaden said. Staff writer Paul Woolverton can be reached at woolvertonp@fayobserver.com, in Raleigh at 919-828-7641 or in Fayetteville at 910-486-3512.